I found this both moving and inspiring. I’ve come to believe that academics and researchers have a moral imperative to fight closed publishing, and this talk by Lessig only makes me feel that more strongly. My mom and I have known since probably last summer that my 78 year old grandmother was experiencing difficulties with day-to-day life, and over the course of the last year she began to drop weight at an alarming rate and have more and more trouble with things like using the ATM machine, paying bills, grocery shopping, and just the stuff we all have to do in life. Her house is about an hour and a half away from us in the town where I was born, and we spent most weekends this spring and summer trying to help her until things reached a point where it was clear weekend visits just weren’t enough or sustainable. She was forgetting to eat through the week, and it was costing us a fortune in gas driving 3 hours back and forth, nevermind the stress and worry when we weren’t there. It’s really sad to see someone you love begin that decline, and it was all the more difficult because her forgetfulness and confusion seemed so intermittent. Some days she seemed perfectly fine, and other days she couldn’t remember how to tie her shoes or use a zipper. One minute she’s ranting about someone in the family in perfectly normal-for-her fashion, the next she’s lost in the town where she’s lived for 50 years. To compound matters, she’s been a “collector” (aka a hoarder) for at least all of my lifetime, and her always packed to the rafters house began to slide into an even more disorganized, cluttered, and dangerous mess than usual. She’s never had furniture or living spaces like most normal people’s houses, but there were at least always clear pathways to the main rooms and around the tv, the kitchen table, etc. Over time, though, even these areas became cluttered and unnavigable, with cords and wires and boxes and bags and plastic tubs of stuff every which way so that even I could hardly get from room to room without tripping. And in her confusion and forgetfulness, she began to develop delusions to explain why some thing that she swore she hadn’t moved was suddenly in a new place in her house – someone must be living in her basement and sneaking up to move things. And the thing she was looking for and couldn’t find – someone must have stolen it. The delusions became so complex and detailed, and so frightening to her, that she began hiding weapons around her house, and carrying big butcher knives around so that the man living in her basement couldn’t attack her. It got to a point where it was truly dangerous to leave her alone. She was so upset over the man in her basement she wouldn’t even leave the house to go get groceries or eat even when we came to help and assured her we’d checked the basement. She was calling the police every couple of days about the man in the basement and was becoming outraged that they wouldn’t even go down there to look for him after a while. It was clearly time that something had to be done. But what? How do you start that process? It turns out that the answer isn’t very clear, or wasn’t very clear to us anyway. We spent weeks making phone calls and searching the internets for advice, and we discovered that at least in Indiana, most of the social services and institutions that we assumed would be able to help us couldn’t. Adult Protective Services cannot intervene until or unless someone files a complaint that an elderly person is being abused, neglected, or exploited. Obviously we were trying to deal with the situation BEFORE any of those problems came to pass. The police couldn’t intervene unless someone filed a complaint that she was a danger to herself or others. And though she was certainly a danger to herself, we didn’t feel like the criminal justice system was the appropriate path to take. We spoke with her doctor, but he was little help at all and in fact was rather insensitive to the situation and made it much worse – after that visit, my grandmother refused to speak to my mother at all and I was caught in the middle. Though I’d hesitate to allege outright fraud, when we discovered how often her doctor was seeing her, how many tests had been ordered, how many different medications he’d prescribed, all for a patient who was clearly suffering from some kind of dementia.. you have to wonder how much Medicare $$ he made from her visits and if that had any influence over his decision making process. It was really pretty scary, knowing that she needed help but unable to figure out how to start the process to help her. 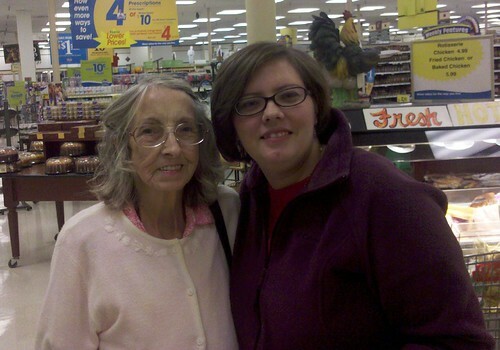 In the end, we discovered that she had to have a psychiatric evaluation and then my mother could apply for emergency temporary guardianship, though even that is complicated by a new law Indiana passed this summer to guard against “granny snatching” since we live in Ohio and she is a resident of Indiana. All of the legal stuff aside, the emotional stress was another terrible weight. We had been talking to her all summer trying to convince her to move to Cincinnati closer to us, but she didn’t want to leave her house, her town, her community, her friends. And who could blame her? She wanted to be in her own house, with her kitties, where she’d lived for many years. She was adamant about staying. But it was obvious that wasn’t an option, so what to do? Finally she was admitted to the hospital for another complaint and eventually qualified medical staff diagnosed her with Alzheimer’s, delusions, and dementia and that made it easier for my mother to get guardianship, but once that happened it opened a whole new can of worms. Which facility in Cincinnati was best? What level of care? And how expensive could she afford? My mother and I toured facilities and asked questions, tried to compare the various options with what we thought would work best for my grandmother, even as my grandmother felt imprisoned and angry that she couldn’t go home, stuck in the hospital and sometimes enjoying the respite from her worries about her cats and the thieves she believed were robbing her and other times upset about being away. We eventually selected a facility but her transfer from the hospital to the new place was frightening for her, and she’s still having trouble adjusting to the new circumstances even as she seems to enjoy the increased stimulation, company her own age, and the activities they have at the memory care unit. I think for the most part she doesn’t realize what actually has happened and she often wonders when she will be able to go home, and when she remembers, worries about her cats. Mostly I’m happy to know she’s somewhere safe even if I worry she’s frightened and worried about being away from home. Reading about Alzheimer’s is scary too, the disease progression is unpredictable and we have no idea how long it will be before she doesn’t recognize us or doesn’t know where she is, and the late stages.. well. I guess we’ll just have to take things one day at a time and do the best we can to make sure she has good care. No matter how young or old you are, you (yes you!) NEED to have a living will and durable medical power of attorney documentation drawn up, signed and witnessed, and filed somewhere easily located (and hopefully shared with your designated caregiver) so that when the time comes that you are unable to care for yourself, someone you know and trust can do this for you. DO NOT WAIT. Do not think that you’re not old enough to worry about it. Everyone should have this, and especially if you have children. It will make what is already a horrible situation so much easier for your loved ones who need to be able to help care for you. Don’t be afraid to ask your friends and colleagues about their experiences with aging parents. Some of the most helpful advice for both me and my mother has come from our social networks and from friends who have gone through similar experiences. It really helps to know that others have faced what sometimes feels like having to choose between least worst options for someone you care about. And above all, talk with the people you love and trust about your wishes regarding end of life issues or what you would prefer if you become incapacitated. While thinking about such things is not particularly pleasant, I feel closer to my mom too, as a result of all of this, and feel that I have a better idea of what she will want when the time comes, and I’ve also talked to her about what I would want if something should happen to me – and that gives me some comfort. Thanks to my friends and colleagues who’ve sent well wishes as we’ve been going through this stressful process, and thanks to the friends and communities I’ve neglected in recent weeks for their patience. I made a vow last year to reduce my conference travel. It seemed prudent to cut back on expenses in this tough budget climate, but more than that, all the conferences began to run together in my mind, all the sessions sounding the same, the airports and hotel rooms one big blur. From time to time I’ve felt sad to miss seeing good netfriends, at SLCC09 especially, but it also felt good to take a step back and not be so darned harried. Until this past week, when so many people I admire gathered at EDUCAUSE 2009, and for the first time I felt a tinge of real regret. Because it sounds like maybe this year’s EDUCAUSE breathed a bit of fresh air into the room. I first met Gardner Campbell (@gardnercambell) through an NMC Summer Conference several years ago (another conference I was sad to miss this year) and I’ve been a faithful reader of his blog Gardner Writes ever since. His passion for teaching, and for exploring the use of technology in teaching in meaningful ways, has been illuminating. He’s the kind of faculty member I want to learn from and collaborate with, and he’s always been unbelievably approachable for such a rock star. 😉 So when I heard he was taking the pro-Twitter position in a Point/Counterpoint session, it seemed like a must-see and I wasn’t disappointed. From now on, when administrators and faculty ask me what the point of Twitter is, I’m not even going to discuss it, I’ll just send them a link to this video. If they aren’t convinced after that, there’s no hope. Thanks to Gardner and Bruce Mass for a great debate and a terrific resource we can share with others. 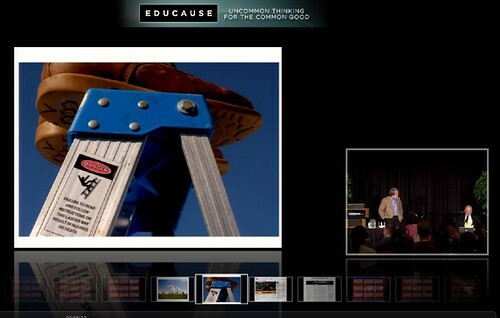 The other “must-watch” video from the conference is really a must-watch for more than just educators. Netizens everywhere need to be thinking about this issue, especially in light of the ACTA treaty negotiations that were leaked this week (see the Electronic Freedom Foundation’s take, ReadWriteWeb, Wired, and more – universal sentiment is “BAD – VERY BAD”). I’m beyond outraged about ACTA and hope to make a separate post on that topic soon. In any case, Lessig delivered a powerful talk about copyright that I hope you’ll take the time to review. You won’t be sorry you did. I refer to the great angst and gnashing of teeth over content theft in virtual worlds. 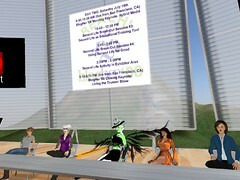 Linden Lab responded to the lawsuit filed by SexGen bed maker this week, a group of content creators staged a 48 hour period of creating nothing to protest content theft, Ben Duranske urged everyone to register their copyright with the US government, and the very controversial Emerald Viewer team filed a DMCA notice to Google about the much vilified Neilife viewer. 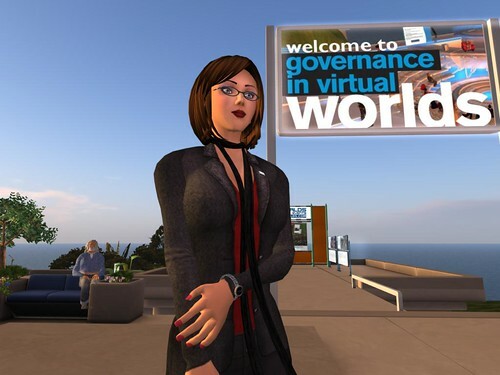 The article finds – unsurprisingly – that virtual worlds now lack many of the elements of the rule of law. Which aspects fail is more surprising, however. Provider agreements and computer software, the sources of regulation that are most often criticized as “anti-user,” provide the best theoretical hope for achieving the rule of law, even if they currently fail in practice. On the contrary, widely proposed “reforms,” such as community norms, self-regulation, and importation of real-world law face both theoretical and practical barriers to implementation of the rule of law in virtual worlds. What are we to make of all this copyright/IP mess? I dunno. I don’t have any easy answers either. But I have long argued that one of the greatest benefits of being involved in virtual worlds like Second Life is that you get to see some of the great issues of our time being played out in another context, a different context than the “real world” – a smaller context – and that this gives us a new perspective with which to view what’s happening in the “real world”. It’s so difficult for me to articulate this thought, I wish I could do a better job of it, but it’s the primary reason I feel like educators – no – academics and intellectuals of all stripes – should be involved in what’s happening in virtual worlds. This copyright issue is just one of many examples, it’s fascinating to see how it plays out in the context of a conversation at EDUCAUSE versus the context and conversations of Second Life. On one hand, we hear Lessig imploring educators and edtech IT folks to find ways to honor the rights of content creators in ways that do not turn our kids into terrorists. He says, and I agree, that the creativity unleashed by mashups in the digital age cannot be stopped. We hear Lessig warning us that by forcing people to live a a life outside the law, we undermine the very rule of law that democracy requires. He urges us to help find a third way, a middle road between copyright extremists on both ends of the spectrum. In another context, in the microcosm of virtual worlds and Second Life, we hear that the rule of law has yet to even emerge, all while we watch from the sidelines as real life courts are asked to adjudicate a potentially precedent-setting case about virtual content theft. We hear some virtual world content creators arguing they must have the right to back up their work, to port their work, the products and artifacts of their creativity, into whatever medium they desire, whatever grid they happen to be on. Other content creators are arguing that so long as the tools to make this backup/portability possible can also be used to steal THEIR content and creativity, these tools should NOT be available. Even though they already are. And, I think they are here to stay, no matter how much Linden Lab tries to enforce some kind of 3rd party registration for viewers. Much to think about. And I wonder, what would the content creators who staged the 48 hour “create nothing” protest say to Lessig’s point? Linden Lab offers standalone “behind the firewall” servers at $50k a year price – are they crazy? But there’s a Masonic feeling to the whole thing: we’re not just individual actors contributing to the common good, we’re individual actors contributing to the evolution of digital spaces that have no governing body, and we’re hoping that in so doing our collective contributions will lead to a common good, without always stopping to have much of a conversation about it, although we start to get worried if it happens all over again: if Google actually turns out to BE the next Microsoft, although it’s typically only the big, easy-to-spot targets that we worry about – the rest of it is too granular, too innocuous, the metadata is invisible to us, it’s all held in those windowless rooms. Healthcare reform passes the House after bitter partisan vote – will it actually improve anything? Is this REALLY what democracy has come to in the digital age? Am I the only one disgusted with the sausage making mess? 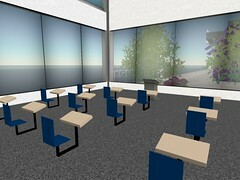 A fellow from the team writing recommendations for the National Education Technology Plan comes to Second Life for feedback – did he get anything useful from the process? I greatly appreciated the effort of the ISTE organizers and all the speakers, and that he made the effort to reach out to cutting edge educators, but I found the process chaotic, frustrating, and unsure what the take-away was. I’ll have to stop here. Too much to process this week. So many things happening right now, I haven’t had time to even blog about them all! Two events happening today and one archived event below.. hope to see you in-world! Robert Bloomfield (SL: Beyers Sellers) is the host of Metanomics, a weekly broadcast (Mondays at Noon SLT/PDT) focusing on current trends and developments impacting vitrual worlds. Their archived events listing powerfully illustrates the depth and breadth of their weekly productions. 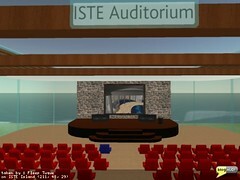 ISTE is proud to be partnering with Metanomics to bring our audiences together in the hopes of facilitating dialogue, networking, information sharing, and join innovation in Second Life. Beyers will be joined by our very own Chris Collins (SL: Fleep Tuque, a correspondent for Metanomics) in a lively, open discussion surrounding the question, “How can Metanomics, and the Metanomics archives, inform K-20 educators, librarians and instructional technologists who would like to use information about business and policy in virtual worlds?” This will be a voice presentation, please be sure you have a working voice setup prior to the event! The event is targeted at industry representatives, legal scholars, policy makers and regulators from around Europe and the rest of the world and is a unique opportunity to interact directly with key stakeholders. Virtual Policy is organised by the Virtual Policy Network (tVPN: www.virtualpolicy.net ) in conjunction with The Department of Business, Enterprise & Regulatory Reform with New York Law School providing program support. This past Saturday, I participated in a BlogHer panel in world. The conference took place in San Francisco and in Second Life and our panel covered Second Life as an Educational & Training tool. Scan the liveblog notes for the highlights on the panel. Thanks to Harold Jarche for the link. This was posted in the context of a series of quotes about the insanity of the “War on Drugs” in the US, but it applies to any number of current issues. I’m reminded of it again after watching some post-election coverage following the Kentucky and Oregon primaries with some talking heads on MSNBC discussing the electoral math, the pledged and super delegate counts, and the big question about whether or not Michigan and Florida’s delegates will count and by which proportion for which candidate, and which proportion of pledges versus super delegates. By the time the segment was over, I understood less than I did when I started watching, and I was left wondering if this was any way to pick a leader in a time when the world seems like an awfully complex and worrisome place, and at a time when I know in my bones that we’re facing global challenges beyond anything we’ve ever faced before. At this point, I’m not sure if the Democratic party is holding water buckets or grenades, but it sure seems to me like Barack Obama is leading the bucket brigade. I hope this contest between the Democratic candidates is over soon so we can get on with the business of putting out the fires.